Deviled eggs have a bad rap — and I’m here to prove that wrong! These Caesar-stuffed eggs are the upscale version of the white trash classic — a classic that I am still fiercely loyal to, I admit. I made these for my best friend Melissa, who is also a big fan of deviled eggs, for her bridal shower, and then just a couple of weeks ago for her baby shower. They were a HUGE hit at the party. Everyone will want to know what’s in them. When you look at the ingredients, you’ll think it’s crazy, but trust me on this one. Why are they so good? The combination of the garlic, lemon and Worcestershire gives them a kick — they have a spiciness to them, and the lettuce works in a nice crunch. You won’t have the best breath after wolfing some of these down, but it’s worth it. They really do taste like a Caesar salad! People who bad-talk deviled eggs will be sneaking these from the plate by the handful. For most of my eggs, I opted to cut them in half instead of stuffing the whole egg, which can be frustrating and tedious. But they do look very cute that way. You can see some of them in the pictures. Piping this filling into the eggs using a regular baggie is asking for a HUGE mess. I tried it. The plastic is too thin and doesn’t stand up to the pressure when you’re squeezing the bag. It might work in a freezer bag, but don’t bet on it. I had to get a pastry kit from Target (with the different tips that texture the filling as it is piped into the egg) and it worked much better. Even then, the bags stood up to only so much squeezing. I had egg yolk filling all over my hands and arms. Not cute. I recommend using a food processor for the filling to make it extra creamy. The lettuce and cheese pose a difficulty if you are piping in the filling. It clogs up the pastry tip. Expect to throw out/eat at least a couple eggs per dozen, whether they don’t peel right, the egg yolks hard boil off-center, or you mess up the cutting/filling job. You can make these a day ahead, but cover them tightly so they don’t dry out, and wait to garnish until just before serving. Credit goes to Rachael Ray for this awesome recipe! Put the eggs in a saucepan and fill halfway with cold water. Set over high heat and cover the pot with a lid. When the water boils, turn off the heat and place the lid over the pot of eggs and let sit 10 minutes. Place the pot of cooked eggs in the sink and run some cold water over the eggs until both the water and the pan feel cool. When the eggs are cool enough to handle, roll each egg on a work surface to crack the shell. Carefully peel off the eggshells and discard. Place the eggs on a cutting board and cut a quarter off the egg from the fat rounded end to expose the yolk. Next, cut just a sliver off the opposite end, the pointed end so the egg is able to sit upright without rolling over. Once all the eggs have been cut, scoop out their yolks into a medium size mixing bowl. Place the egg white halves back into the egg container for easy transport and filling, making sure the holes are pointing up so that you are able to fill them with the Caesar mixture. To the bowl with the yolks add the anchovy paste, Worcestershire, mayonnaise, garlic, onion, Parmigiano-Reggiano, lemon juice, salt and freshly ground black pepper. Mash up the yolks with a fork until the mixture is paste-like. Mix in half of the shredded romaine, reserving the rest for garnish. Spoon the egg mixture into a plastic, re-sealable bag and squish it all into one of the bottom corners. Snip off the corner and squeeze out a bit of yolk mixture into each of the egg whites. Once all eggs are filled, garnish them with a sprinkle of extra cheese and some additional shredded romaine. Close the container lid and you are off to that party! 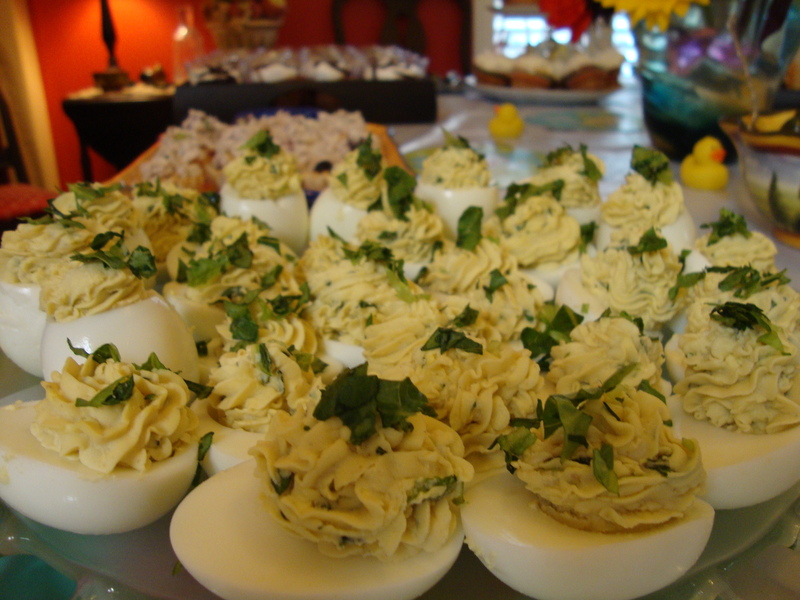 This entry was posted in Recipes, Uncategorized and tagged appetizer, deviled eggs by Tricia. Bookmark the permalink. Thanks! Deviled eggs are one of my many weaknesses.